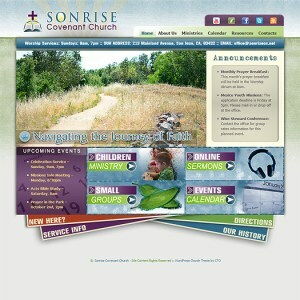 Are you in the market for a bold, inspirational church website design, that's also user-friendly, and portable to various devices? Well, look no farther. This new design is a WordPress responsive church theme - meaning it offers specific rendering for a variety of devices: desktops, laptops, tablets, smart phones, etc. That means that people will not only be able to access your church website, but they'll be able to do it from any number of devices. So make a bold online statement, and one that reaches the greatest number of people, with this new premium responsive WordPress church theme from CMS Themefactory.